Take her breath away with this stunning diamond bridal set from Perfect Fit. Crafted in 18ct yellow gold this bridal set features 1/5 carat diamond cluster and set with dazzling diamond shoulders for endless sparkle and glamour. 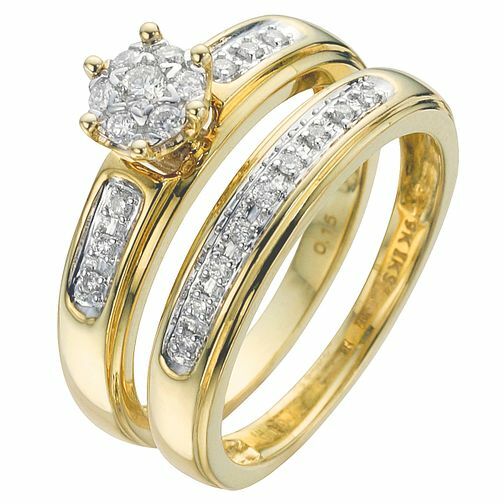 18ct Yellow Gold 1/5ct Diamond Perfect Fit Bridal Set is rated 3.0 out of 5 by 1. Rated 3 out of 5 by Anonymous from Excellent bridal set. Service and quality is a question The set itself looks amazing. However, within a couple of years one diamond fall out of the ring right in the middle of the "bloom" so required replacement. Within three months after replacing missing stone it fallen out again. I consider it as a serious issue. Feeling disappointing and not happy at all to pay each three months for replacing missing stones. Can't recommend repair service.